I had just purchased Ina Garten’s new “Foolproof” cookbook back in 2013 and this amazingly delicious recipe was in there. I have to admit, I didn’t care for the way the lamb shanks looked raw but luckily I got past this. It was Oscar night 2013 and I couldn’t wait to sit down and watch. My idea of an Oscar party is to eat dinner at home and be in my pj’s by the time they start. Being out in Colorado means they start red carpet at 3, so dvr was set and I got to work on dinner. I like to watch the Oscars themselves live, so I had my work cut out for me. I also like watching alone, with texting and tweeting its like you are never alone anyway. It was a perfectly cold winter night, and Joel and I both love braised meats. This was pretty easy to pull together and I did it in under an hour, put in the oven and 2 hours later we were ready to eat this delicious meal. I must say the orzo was spectacular, and I would make this without meat as well. This was my original post and then this New Years Eve it was on the menu again! We shared New Years Eve with our dear friends and spent the afternoon shopping and cooking! Now that’s my kind of meal. It takes a little work but totally worth the effort .I put up some pics of this as well. 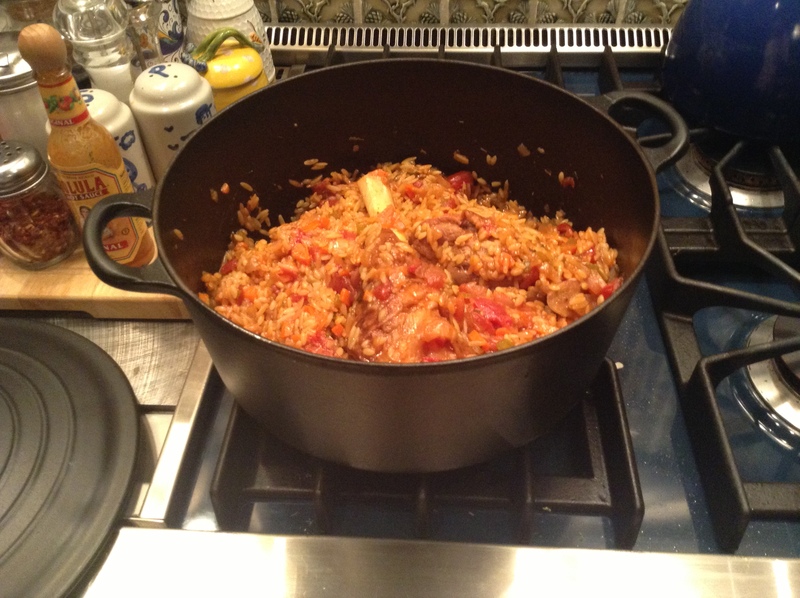 *this recipe serves 4, I cut it in 1/2 for Joel and I, but I made the 2 cups of orzo which we ate the next night as well. Combine the flour, 2 teaspoons salt and 1 teaspoon pepper in a bowl and dredge the lamb shanks in it, shaking off any excess flour. 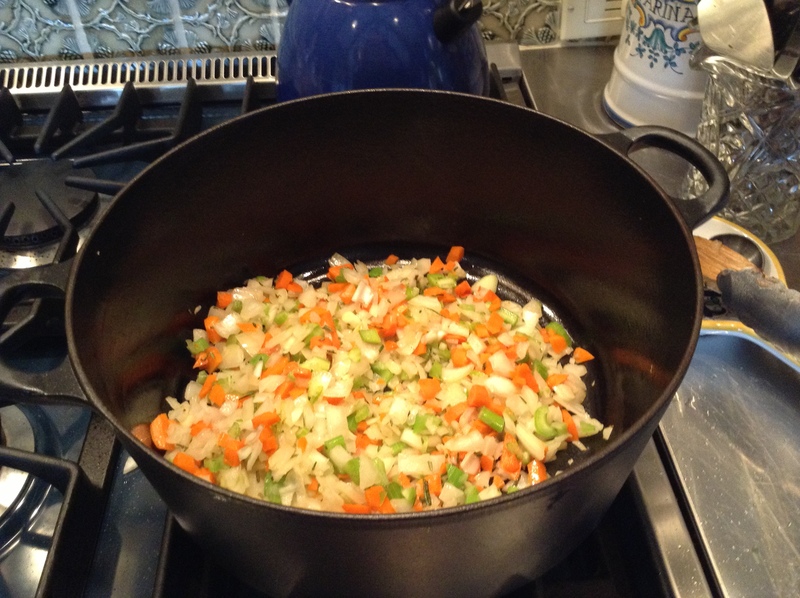 In a large Dutch oven such as Le Creuset , heat 3 tablespoons grapeseed oil over medium -high heat . Add lamb shanks and cook for about 10 minutes, till browned on all sides, using tongs let them brown on all sides, be careful not to burn oil. Transfer the shanks to a plate. 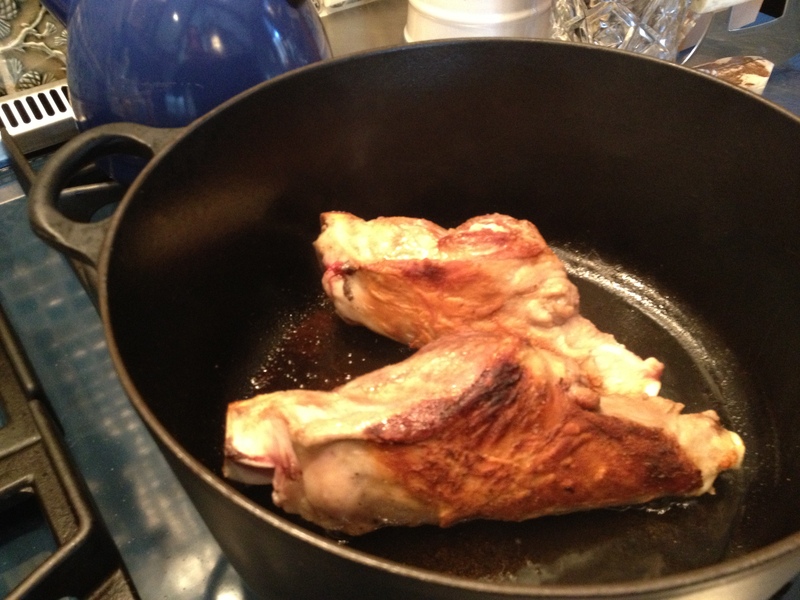 Don’t crowd the shanks, so do 2 at a time, you may need to add a little grapeseed oil for the second time. Let pot cool a little and wipe Dutch oven with a paper towel, removing all remnants of old oil. Add the olive oil and heat over medium to medium high heat. 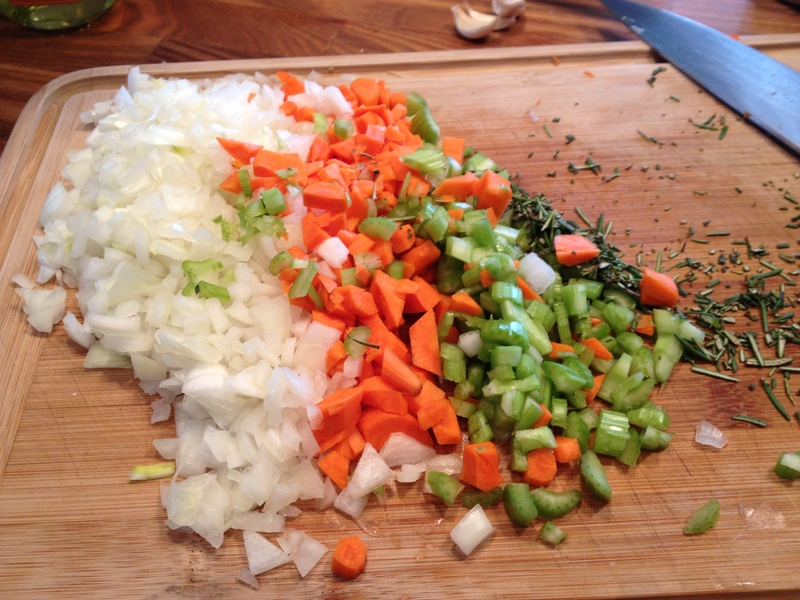 Add the onions, carrots, celery, rosemary and cook for about 10 minutes until all veggies are tender. Add the garlic and cook for another minute. Add the can of tomatoes, beef broth, wine, 3 teaspoons kosher salt and 2 teaspoons pepper. 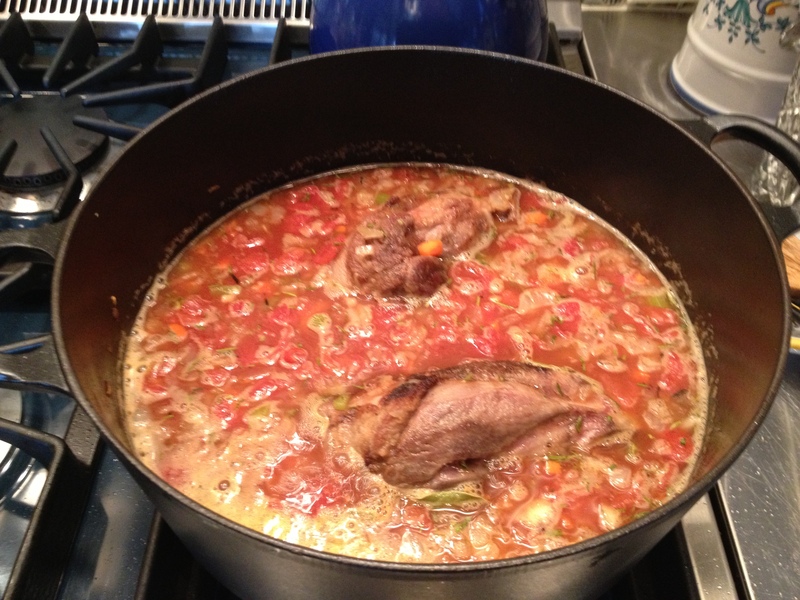 Add the lamb shanks, try and submerge them as much as possible in the liquid. Put in the bay leaves and bring to a simmer on the stovetop. Once it is simmering, cover the pot and place in the oven for 2 hours, I turned the shanks around after the first hour. 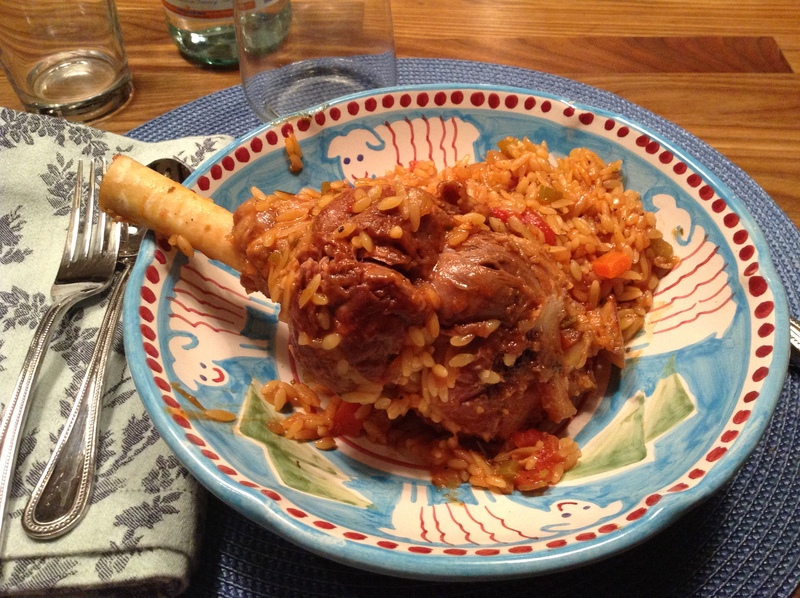 After 2 hours, add the orzo, stir it in and return the lamb shanks to the oven for about 20 minutes, until orzo is fully cooked and the lamb shanks are very tender. Discard the bay leaves, stir in 3 tablespoons of white wine, and taste for seasonings. Mine didn’t need any more seasoning, I also cut original salt in the recipe to 3 teaspoons instead of 4 and it was perfect. You can always add additional salt at the end. 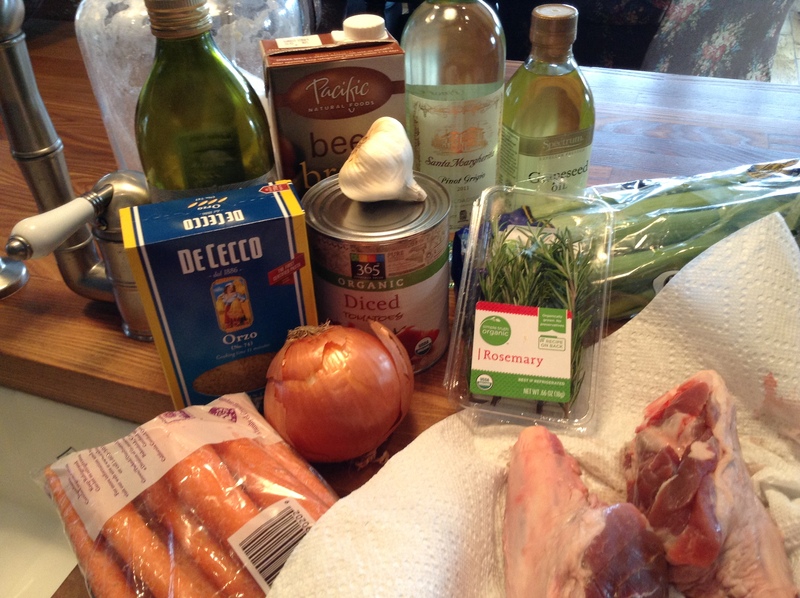 This entry was posted in meat and tagged Lamb Shanks, Lamb Shanks and Orzo, Orzo with Lamb Shanks. Bookmark the permalink.